As a gustatory gladiator, Eric Booker has seen it all - and seldom, if ever, have his eyes proven bigger than his stomach. Unlike Frost's proverbial path in the woods, Booker's esophagus is a road more traveled. Over five-plus years of eating contests, he has downed hundreds of hot dogs. Countless chicken wings. More matzo balls than a rabbi on permanent Passover. His conclusion? None of it - not even a heaping helping of cow brains - makes a whit of difference. "There's no food I won't eat," said Booker, 33, a subway conductor from Long Island, N.Y. "Put me on 'Fear Factor' and I'd do well. Every food is a challenge. And my goal is to conquer every challenge in food." Such is life in the overstuffed world of competitive eating. Long a staple of food festivals and country fairs, noshing for sport has ballooned at a rate to shame Matthew Perry, complete with sponsors, prize money, an international governing body, a year-round circuit and a roster of buffet-busting, er, athletes. The goal? Eat as much as you can, as quickly as possible. The rules? Only one matters. If you heave, you leave. "I've almost thrown up a couple of times in competition," said "Kid" Cary DeGrosa, 55, a competitive eater and a property manager from Las Vegas. "It's like an athlete that's running a marathon. Your stomach is saying no more. You have to just push everything down. It's a lot of muscle action." Is it ever. In a 1999 contest held in Las Vegas, DeGrosa ate 133/4 hot dogs and buns in a scant 12 minutes. Total calories? Almost 3,500, according to an American Meat Institute online calculator. "I took a plane to Phoenix afterward, and I couldn't drop the tray table," DeGrosa said. "Even putting the seat belt on was tough." Booker - a k a "Badlands" - nearly doubled DeGrosa's total at this year's Nathan's Famous world hot dog eating championship, scarfing 26 wieners [6,500 calories] to fall just short of his 28-dog American record. 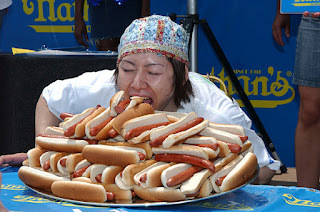 Then there's two-time world champion Takeru "the Tsunami" Kobayashi, the Tiger Woods of competitive eating. At the Nathan's contest, the Japanese speed eater buried Booker - and everyone else - by downing a gut-busting 501/2 frankfurters [12,625 calories], topping his 2001 record of 50. Before the event, the 24-year-old Kobayashi weighed in at 113 pounds; after, he swelled to nearly 120. "When you're going against a guy like that, you're going for second or third [place],' said Steve Addicks, 43, a competitive eater and a locomotive machinist from Finksburg, Md. While competitive eating aficionados - and yes, they exist - claim that gurgitatory combat dates back to prehistoric man's quest for, well, supper, the sport has its modern roots in the much-celebrated Nathan's contest, held annually at Coney Island on the Fourth of July. In 1991, New York-based corporate publicist George Shea took over supervising duties for the 87-year-old event, which has been canceled only twice: in 1941, to protest World War II, and in 1971, to protest free love [no, really]. Before long, Shea realized he had something more than relish on his hands. "We never made any money on it, but we got a huge kick out of it," he said. "And it kept growing and growing. It became an international event. We started getting sanctioning requests from all over." In response, Shea and his brother, Richard, founded the International Federation of Competitive Eating [IFOCE]. Like a boxing governing body, the federation promotes upcoming events, encourages safety standards and posts world rankings. The group's motto? "Nothing in Moderation." Currently, IFOCE oversees a 12-month circuit that runs a culinary gamut from chicken wings [January] to pickled quail eggs [April] to french fries [December]. Roughly 1,000 active eaters, 66 of them ranked, compete in more than a dozen states, as well as England, Germany, Scotland and Thailand. The federation even awards a championship belt - mustard yellow, of course - to the winner of the Nathan's contest, the de facto Masters of the eating tour. industrialized nation of big eaters. And the competitive edge is there." Though the IFOCE has risen to semi-prominence on the strength of its everyman appeal - who among us hasn't loosened a belt buckle at Sizzler's All-U-Can-Eat shrimp night? - competitive eating's legitimacy as a sport remains in question. The reason? Largely, it's the fact that IFOCE's "gurgitators" - their term, not ours - resemble, well, every man. At 6-foot-5, 400 pounds, Booker looks more like Dom DeLuise than Donovan McNabb. For his part, DeGrosa has all the athletic gifts of a McDonald's All-American, sans the All-American stuff. "I've always been a big eater," DeGrosa said. "My mother's Jewish and my father's Italian, so food's my field. I'm hungry all the time, but I feel guilty about it." 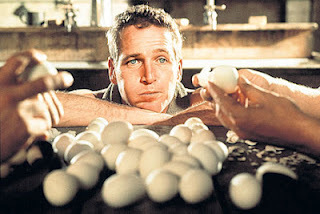 That said, eating contests are anything but easy. Even for self-professed big eaters, a category that includes, um, just about everyone on the IFOCE circuit. Jaw strength helps, as does the stomach capacity of a killer whale. And according to Addicks, the ketchup-spattered line between winning and losing - not to mention upchucking - has as much to do with mental toughness as intestinal fortitude. "For those 12 minutes with the hot dogs, it's all business," said Addicks, who scarfed 22 of them to finish fourth in the 2000 Nathan's contest. "You just focus on what you're doing so you don't choke." Gagging aside, speed gobbling can wreak havoc on the body. Following his first hot dog event, Booker spent an evening curled up on his living room floor. DeGrosa beats a hasty retreat to his hotel room after each Nathan's contest. "When I'm done, it's like every ounce of me has gone to my stomach," he said. "I feel like I'm on Prozac. I'm in a haze. It takes a few days to get your system back in order. And I get a little blocked up." Other foods trigger the opposite effect. According to Dr. Brian Lacy, a gastrointerologist at Johns Hopkins, high fat edibles like mayonnaise and ice cream can cause painful cramps and severe diarrhea. Not to mention Enron-quality natural gas. "I was in an ice cream eating contest once, and I'm glad I drove myself home," Booker said with a laugh. "I didn't need any gas that day." In order to swallow, say, 152 jalapeno peppers in 15 minutes - as Jed Donahue did last year - many IFOCE gurgitators engage in gut-swelling training exercises. Booker drinks water by the gallon. Kobayashi chews on cabbage, which expands in the stomach. Preferring a more traditional approach, DeGrosa hangs out at - where else? - Vegas buffets. "They used to have 29-cent breakfasts here," he said. "I would order six of them, and just go to town." Strategy also plays a role. DeGrosa fasts for 24 hours before competing. Others swear by a regular meal the previous evening. Either way, quick starts are crucial, mostly because the sensation of being stuffed takes six to eight minutes to kick in. "If you eat very, very fast, it takes awhile for the brain to catch up," said Lacy, director of the Marvin M. Schuster Center for Motility and Digestive Disorders. To speed his intake, Kobayashi splits his hot dogs in half, then eats both sides simultaneously - a technique dubbed the "Solomon method." Booker favors the "Double Japanese" approach, which basically consists of eating two dogs at the same time. Almost everyone dips his buns in water before eating them, a trick that shaves precious seconds of chew time. "A hot dog and bun, you have to have a style and strategy that's different from a chicken wing, which is different from a matzo ball," Shea said. "Athletics are not really about superior fitness. They're about superior refinement of skill. That's what Babe Ruth did. That's what this is." Sport or otherwise, competitive eating continues to grow - so much so that IFOCE has taken on some decidedly major league trappings. An offshore sports book gave odds and took bets on this year's Nathan's contest [Kobayashi was a 20-dog favorite]. Philadelphia's yearly "Wing Bowl" draws almost 20,000 fans. An April oyster-slurping championship in New Orleans was sponsored by Tabasco Brands and Miller Lite. And competitive eating was the subject of two recent television documentaries - one on the Food Network, the other on the Discovery Channel - as well as the "Glutton Bowl," a two-hour, prime-time special on Fox. "I'll be at an event, and there's a guy out in the crowd with an IFOCE T-shirt who isn't even an eater," Shea said. "It's really gratifying. We've been doing this for a long time, and it really has blossomed." Eating contests are even more popular in Japan, where Kobayashi reportedly earned between $150,000 and $250,000 in prize money last year. "In Japan, these guys are stars, like Magic Johnson and Michael Jordan," Booker said. "They have sponsors, they go to retreats to train. They have contests like twice a month. We're at a disadvantage." Kobayashi pocketed an additional $25,000 for his victory in the Glutton Bowl, which featured many of IFOCE's top eaters, including Booker, Addicks, Dave "Coondog" O'Karma and Greg "Gaseous Maximus" Frye. Filmed over three days, the event mixed food contest staples [hamburgers, hot dogs, sushi] with more exotic fare [mayonnaise, beef tongue, bull testicles]. In a final round tour de force - or, more accurately, tour de yuck - the ever-hungry Kobayashi scarfed down 17.7 pounds of cow brains in 15 minutes, good for a world record. "They put like 10 pounds of brain on a platter," Booker said. "When they took the top off, I was like, 'Oh, my God, how am I gonna get this down?' But if you have a strong will, you can eat almost anything." Kobayashi's epochal 50-dog performance in 2001, a handful of American gurgitators accused him of using muscle relaxers. Others speculated that his stomach was surgically altered. At this year's Nathan's event, television cameras caught Kobayashi dribbling regurgitated hot dog and bun from his nose and mouth. Fellow contestant "Hungry" Charles Hardy, a New York City corrections officer, demanded a disqualification. Instead, Shea and a pair of judges ruled that Kobayashi's, er, reversal of fortune had taken place after the final buzzer. "We're not the WWF," Shea said. "The records that are set and the contests that are held, there's a winner and a loser. It's not scripted and it's not messed with. Ever. "That said, we're not opposed to controversy. If there's one thing that truly generates press, that's it." Of course, the notoriety that has helped feed the competitive eating boom also carries a price. Last summer Booker was stunned to see his picture hanging above the cash register at an All-U-Can-Eat sushi joint in New York. "It was US Weekly's photo of the week, me holding a hot dog while Kobayashi was doing his thing," he said. Undaunted, Booker headed over to the buffet - only to find the restaurant's owner waiting for him. "He looks at the picture, looks at me, and says, 'OK, mister, you have a 30-minute limit,'" Booker said with a laugh. "I couldn't believe it."